Press Button A. 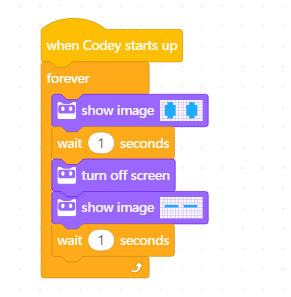 One second later, Codey&apos;s screen will display the image. 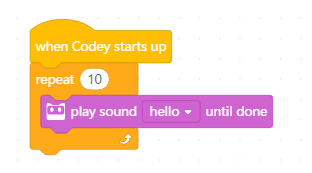 When Codey starts up, it will play the sound "hello" for ten times. When Codey starts up, Codey&apos;s will repeated display the two images consecutively. 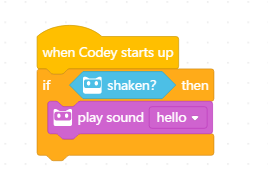 When Codey starts up, if being shaken, Codey will play the sound "hello". 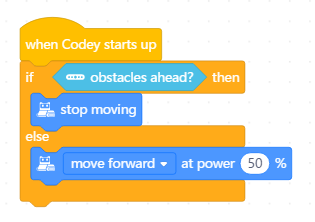 When Codey starts up, if there are obstacles ahead, Codey Rocky will stop moving. 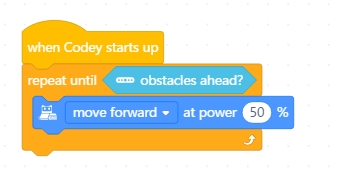 If not, Codey Rocky will keep moving forward at 50% power. Wait until the report condition is met. Run the script. 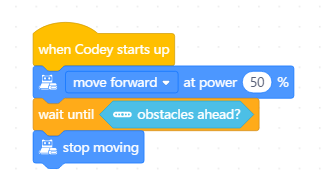 After starting up, Codey Rocky will keep moving forward at 50% power until Rocky detects obstacles ahead. Press Button A to stop all scripts.